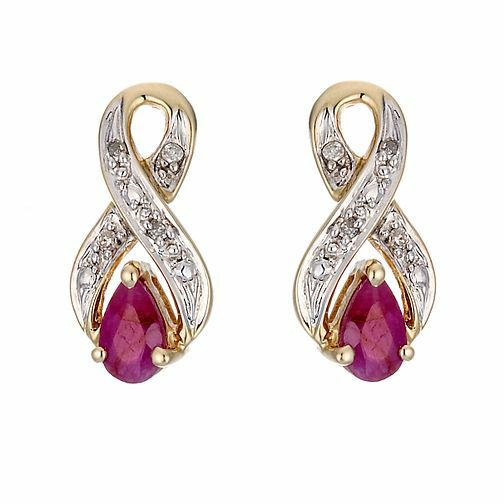 Featuring diamonds and rubies, this stunning pair of 9ct yellow gold and rhodium plated figure of eight earrings will bring a splash of glamour to any look. 9ct Yellow Gold Rhodium Plated Diamond and Ruby Earrings is rated 4.8 out of 5 by 4. Rated 5 out of 5 by Anonymous from Excellent customer service The website was clear and easy to use. The earings were exactly as described. The service was excellent and delivery was very prompt. All told it was a very good shopping experience. Rated 5 out of 5 by Anonymous from Very Pretty I am so pleased with these earrings that my husband has just bought for my Birthday while on a trip to Manchester and they perfectly match the ring he also bought me for our Ruby Anniversary in June.